Setting up your HTC Vive may seem daunting at first. There are 16 components neatly boxed from Valve and HTC and you may need to drill holes. In the end though, it's completely worth it especially after all that hard earned dough went into upgrading your computer and buying the £689 headset system. The set up program says it takes only 30 minutes but realistically, if you haven't already shifted your furniture around, it will probably take around an hour. I live in a microscopic San Francisco studio and was able to conquer Vive set up in a reasonable amount of time so I'm confident you can too. The team in London, on the other hand, set up their Vive in our Shoreditch office so had a bit more room to play with. First up, make sure you have everything you need to get started - a PC (obviously), monitor, mouse, keyboard and any cables that aren't included such as a miniDisplayPort to DisplayPort if you need that - see 'cords, more cords...' below. After you clear your space, get ready to move stuff around a bit more. The set up program will let you know if there's enough room when you measure it with the Vive controller (this is how the chaperone grid is defined, you'll look pretty silly doing this). The minimum requirements are 2m x 1.5m or 6ft 6in x 5ft. You'll also need a maximum of 16ft between base stations and these need to be able to see each other. Remember how I said there's 16 items? One of those is a cleaning cloth and another are headphones. So really, it's not that bad. I also found that not every cord is needed though you'll still want to keep everything. The sync cable for example, remains sitting in its packaging but I've been prompted to use it when my sensor tracking gets lost. I eventually might break it out but right now, everything's continuously corrected itself so I've left the cable tucked away. Don't forget to get all the items out of the box at least once though or else you might forget you need it. Start with downloading the set program from HTC on your PC - these are your instructions, not the big bit of paper, stick with them - and taking the base stations out. Step 3: To drill holes in the wall, or not? This was a tough one for me. The base stations have to be in high places (basically taller than you), angled toward your play area and near outlets for power. You want them to be showing a green light and 'b' and 'c'. I'll be moving in a few weeks and would like that hefty security deposit back so I decided to not make holes in the wall. Thankfully, tripods and stands are compatible with the bases, but I didn't have enough time to order any nor do I want more clutter. If you do decide to take the plunge, the Vive box comes with wall mounts and a handy guide. My solution isn't the prettiest set up. For the time being, one base station lives on top of a box and the other in my dish cupboard. I used a ton of duct tape to secure the bases down but this is all just temporary because Valve does not recommend shaky surfaces since the bases vibrate. Case in point, the base station in the cupboard actually fell once. It didn't fall from a very high place or sustain any damage but I nearly had a heart attack. Over in the UK office, the eds there also went for a temporary set up for their review sample - a stack of boxes and one basestation perched on top of a TV. Not practical in the long run and drilling/mounting is planned. Break out the Link Box and Link Box power adapter, then connect them. Then plug the HDMI and USB cords into the back of the box and your computer. The back is the non-orange side. Big note from the UK team: if your PC's graphics card only has one HDMI port and you're using it for your external monitor, then you'll need to buy a miniDisplayPort to DisplayPort cable to connect to the Link Box. If it has two or more, you can use the included HDMI cable. Now, take out the HTC Vive headset, behold its glory and ability to transport you to a world of fun - then plug its cords into the front of the Link Box. You need the Vive headset's LED (on the left hand side) to be green to get going (not red). Make sure your Vive controllers are charged up, via microUSB, too. They should have a decent amount of power but press and hold the buttons on below the circular track pad to make sure. The lights should all be green on the bottom (not orange or blinking). They don't take too long to get to fully charged but it's a pain when you're in the middle of a game and one conks out. Whenever you launch SteamVR it will check that all the components are powered and can track each other. If all is working well, the icons will be green. If not, you'll be directed to troubleshooting instructions. Plug the headset into your computer then follow the prompts, trace the playable area with the controller. 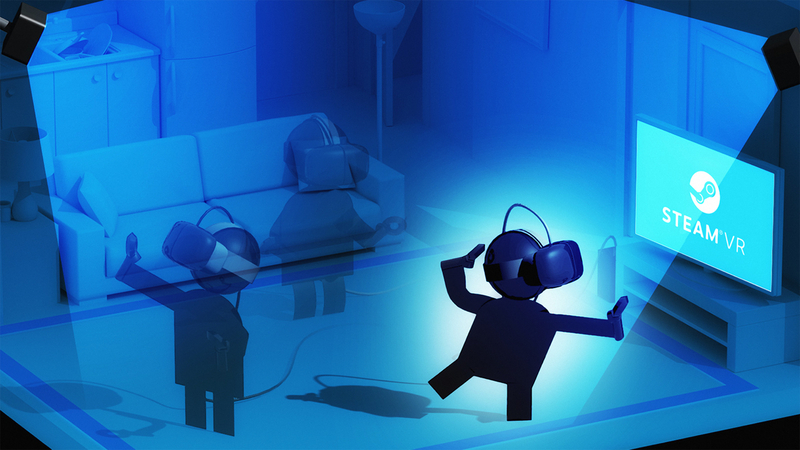 Now you're all set to download some games and experiences from Steam, starting by hitting 'Launch' within the HTC Vive app or popping the headset on and selecting from there. You can also have fun with robots in The Lab and Job Simulator, create works of art in Tiltbrush or building weird stuff in Fantastic Contraption, all of which are part of the Vive package. If you plan on standing or sitting with the HTC Vive, it's all about the same. However your base stations can be closer together and you won't need to clear out as much space. Simply choose the standing option then run the rest of the on-screen instructions after you arrange your designated seated experience area.